John Lewis Partnership is a well known UK retail brand, operating 45 John Lewis departments stores, 342 Waitrose supermarkets, alongside an online and catalogue business. John Lewis’s children’s shoes department was experiencing a high volume of parents and children visiting the stores to buy school clothes and shoes before the start of the new school year. Parents were frustrated whilst waiting to be seen and were leaving due to the wait. Staff were trying to manage the queue through a cupboard and pen system, but were losing track of who was next and how long the wait time would be. The children’s shoe department in John Lewis’ Kingston store, installed Qudini’s Digital Queue Management platform. And this meant busy parents could leave their mobile number with John Lewis staff and receive an SMS message confirming their approximate wait time, with a weblink to a live countdown. It meant customers could leave the department and continue shopping in John Lewis, with the knowledge they would be notified by text with a time they would be seen and even who would be seeing them. Staff were able to manage customers requirements, have full visibility of all the customers in the queue and could assign available staff as needed, all through the Qudini platform. The system was even mentioned on BBC Radio 5 Live by Eleanor Oldroyd. In the clip she explains how the experience was great and they shopped whilst they waited. in the number of customers served, now that more customers were willing to wait, the waiting experience was improved and staff were more efficient. This lead to greater sales. in potential revenue per store per annum as a result of the increased volumes of customers served. more customers were willing to wait for service, delighted to know they could go away and browse and not lose their place. whilst customers waited they went to browse other departments and many returned for their shoe fitting with purchases they made whilst they waited. more customers approached the calmer department for service. partners were able to improve the service they provided to customers. a calmer department improved partner efficiency, due to fewer customers asking about their turn as they tried to serve their current customers. staff had more time to put away shoes between appointments, and this improved sales by ensuing greater stock availability was on display and in the stockroom. John Lewis’s Electronics department regularly experiences a high footfall of customers wishing to discuss in-store technology offerings. To ensure a fair and managed waiting experience, a John Lewis partner would stand at the front of the department with a clipboard, taking customer names so that they could be ordered according to their turn in the queue. This however, presented a number of challenges. Only one person at a time could write down the names of waiting customers; handwriting was often illegible or names spelt incorrectly; locating customers when it was their turn was often confusing; and at the end of the day, the sheets of paper containing potentially valuable customer details were thrown away. John Lewis decided to use the Qudini digital queuing system. 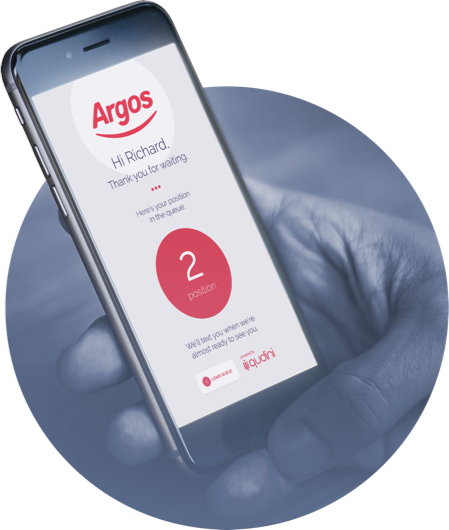 It enables a host and department managers to access the Qudini app on a tablet and take down the names and smartphone numbers of customers wishing to speak to a John Lewis partner. Once added to the queue, Qudini’s system calculates the customer wait time so that their expectations can be managed more effectively. If the wait time is long, the customer can receive a SMS containing their queue position and wait time, plus a further SMS update when their turn arises. By allowing multiple hosts access to the Qudini app at the same time, they can add to, or manage the queue in real-time. Individual partners can also access Qudini from their mini-smartphone devices, in order to address the next customer by name and serve them more efficiently. Data is captured on waiting times, service times and partner performance. The more professional queue management experience improves John Lewis’s image as a digital and customer-focussed brand. The waiting experience significantly improves customer satisfaction and enhances partner relationships with their customers. The digital system enables staff to be more organised and efficient across the shop floor. They can manage their time, activities and breaks within the Qudini app. John Lewis now has access to valuable granular data on customer product interest, wait times, staff service times, sales performance, and much more. Qudini enables John Lewis to track customers seen and the outcomes of those conversations, helping the retailer to better understand conversion. The Qudini system and SMS updates enables customers to relax during their wait, freeing them up to browse until it’s their turn to be seen. Many return with purchases they’ve made whilst waiting. During Black Friday peak, Qudini enabled John Lewis partners to manage the significant numbers of customers entering the department to take advantage of the Black Friday deals, and provide them with a better experience. Walkouts reduced with 97% of customers waiting their turn for service.